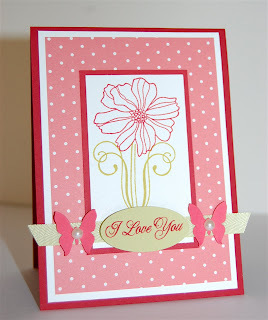 I used Fifth Avenue Floral (SU! ), Fancy Flourishes (PTI - for the leaves on the flower) and Damask Designs (PTI) for the sentiment. Colors are: Ruby Red (SU!) Berry Sorbet, spring moss (PTI) and Whisper White (SU!). The butterfly punch is Martha Stewart. I don't know what's gotten into me but I'm loving butterflies lately. I'm really getting girly. Maybe it's because I live in a house full of boys!! Have a great weekend. I'll post next week when we get home from our Ohio trip!! Very pretty, love your butterflies. LOVE how pretty and crisp your card is! Love the stamp and the two butterflies!